Optical Surfaces Ltd. has delivered a challenging 300mm diameter off-axis paraboloid and a mounted flat mirror to SIMERA Technology Group (Pty) Ltd – an engineering design and development company specialising in the development of UAV and small satellite optical payload systems. Drawing upon its highly experienced and skilled production team – Optical Surfaces manufactured the off-axis parabolic mirror with surface accuracy of better than lambda/15 P-V, surface quality of 20/10 scratch/dig and surface slope error of lambda/10/cm P-V. This, together with an ultra-smooth coated reference flat (315 mm diameter), have been produced from Zerodur™ as the main reflective and reference components, for a large flight test alignment collimator under construction in SIMERA Technology Group’s optical clean room. This will be the largest and most capable privately-owned facility for testing of airborne and spaceborne optics in South Africa. Optical Surfaces Ltd has been producing optical components and systems for more than 50 years and is now accepted as one of the world’s leading manufacturers of high-precision optics for satellite and space borne systems. The company’s ISO 9001-2008 approved manufacturing workshops and test facilities are deep underground in a series of tunnels excavated in solid chalk where temperature remains constant and vibration is practically non-existent. With such stable conditions testing, particularly with long path lengths, becomes quantifiable and reliable. Working with these natural advantages is a highly skilled team of craftsmen with a commitment to excellence in both product quality and customer service. For more information on SIMERA Technology Group please visit www.simera.co.za/ or contact them on +27-21-852-6450. 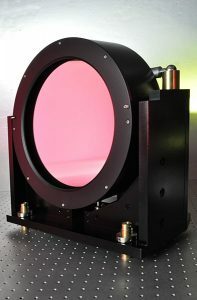 For further information on demanding, high precision optics for space research and satellite systems please visit www.optisurf.com or contact Optical Surfaces Ltd. on +44-208-668-6126 / sales@optisurf.com.